The concept is simple: It’s uneconomical for an HDD vendor to sell an HDD for less than some floor price. This price is somewhere between $35-50; the chart is based on a $50 floor price. That’s where the black line (representing HDD rices) flattens out. SSDs, on the other hand, can be produced at significantly lower capacities at a price that is roughly proportional to the cost of the flash chips, so the red line continues to drop even at very low capacities. At some point an SSD becomes the cheaper alternative. In this chart the crossover was about 6GB. SSDs were selling for ~$10/GB back then! 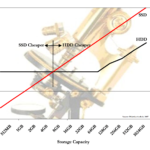 High-capacity HDDs became most economical at only 100GB. Prices and capacities have changed phenomenally since then! SSDs now sell for ~$0.17/GB. HDDs still have a floor price of $35-50 in high volumes and become most economical at 4TB. At these prices any capacity lower than 200GB will be more economically served by an SSD. Above that size (500GB, 1TB) there will be some ratio that depends on the capacity. This ratio approaches 10:1 once the capacity reaches the HDD’s cheapest capacity. This would be the knee in the black line. The 2019 and 2007 charts bear strong similarities. The black line becomes roughly horizontal at 4TB and lower capacities ($63-$76), while the red SSD line continues to drop. 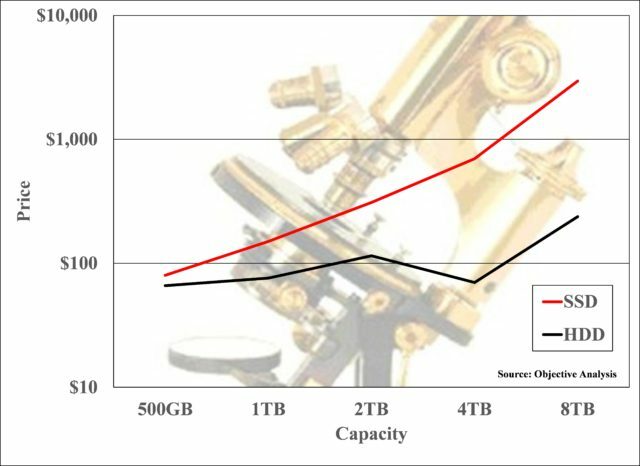 If the article had included data for drives smaller than 500GB we would have seen an HDD/SSD crossover, just as we see in the 2007 chart. Consider that Objective Analysis published this finding in 2007. How would you have planned your business if you had this kind of market understanding 12 years ago? Would it have made a difference to your success? Of course it would! If you would like to learn how to work with us to gain this kind of strategic advantage and visibility into the future please contact us. 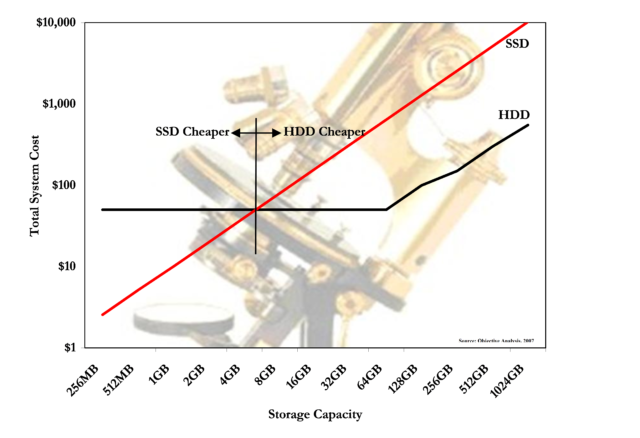 3 Responses to Are SSDs Approaching Price Parity with HDDs? Thanks, Zsolt, for reminding me of that! Thank you for the information. The charts are very helpful. Is it possible to add another chart that shows the trend of HD prices per GB vs SSD prices per GB over time? When will SSD Prices Drop Below HDD Prices?